This report presents findings from a national study of digital inclusion organizations that help low-income individuals and families adopt high-speed Internet service. The study looked at eight digital inclusion organizations across the United States that are working at the important intersection between making high-speed Internet available and strengthening digital skills—two essential and interrelated components of digital inclusion, which is focused on increasing digital access, skills, and relevant content. Providing low-cost broadband: Cost continues to be a major barrier to broadband adoption. Successful interventions will need to address “ability to pay” rather than “willingness to pay.” While all low-income individuals and families who participated in this study understood the value of broadband connectivity, most explained that cost remained the most significant barrier to adoption. Successful digital inclusion efforts should recognize the role that persistent poverty plays in shaping people’s abilities to access and use computers and the Internet. The findings suggest that more research is needed to understand budgeting issues and other concerns related to people’s experiences living in poverty. Connecting digital literacy training with relevant content and services: Many digital inclusion organizations have developed innovative digital literacy training strategies to assist those who do not feel the Internet is relevant to them as well as those who already understand the importance of the Internet to their everyday lives. Many organizations also provide mobile digital literacy training in which they go outside their physical walls to reach people in places that are convenient to them. Making low-cost computers available: Low-cost or free computers are often just as important as having access to low-cost or free Internet options, particularly for people in low-income communities. Digital inclusion organizations have embraced this reality by refurbishing older computers and making them available to low-income people for free or at a reduced cost. Some digital inclusion organizations also provide ongoing technical support to residents who need the social and technical assistance to keep their computers up and running—and connected online—over time. Operating public access computing centers: Many digital inclusion organizations also maintain public access computing facilities that allow residents to access technology in places in which they feel comfortable and supported. These spaces also complement the digital literacy classes that are often offered in the same location. Low-income individuals and families value public access computing centers because they are often in convenient locations and have helpful staff that provide them with one-on-one support with computers and broadband Internet access. The importance of citywide and regional initiatives: All of the organizations identified the importance of citywide and regional digital inclusion initiatives and indicated the strength in coming together with other community partners and collaborators to support digital inclusion activities and share best practices. However, funding remains an issue to support these broader digital inclusion coalitions. Concerns about program sustainability: No one or mix of commercial providers delivers the full suite of access, computing, and training that non-adopters need to take advantage of the content and services broadband has to offer. Moreover, most organizations that participated in this study expressed a concern that funding for organizations is limited. More funding and support are needed for all organizations in this study that are connecting low-income residents to low-cost Internet, digital literacy training, low-cost computers, and public access computing. The need for outcomes-based evaluation: Most of the digital inclusion organizations that participated in this study did not have outcomes-based evaluation frameworks. However, all recognized the importance of having them. One of the surprising findings from the study was the need for outcomes-based evaluation frameworks at both the organizational and citywide/regional levels. This remains a need in many of the organizations studied. 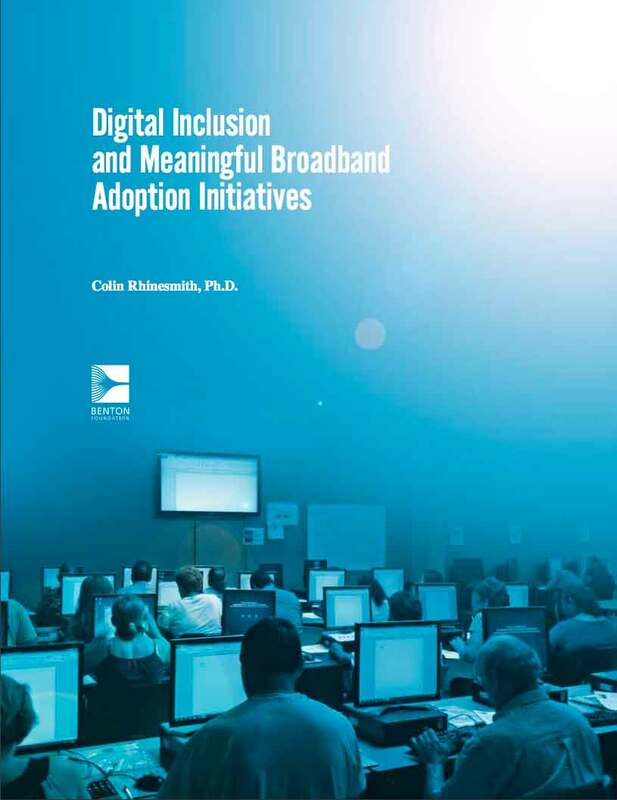 Digital inclusion and broader policy goals: This report also joins other researchers who have argued that digital inclusion needs to be connected to broader policy issues in order to show the impacts of digital inclusion and meaningful broadband adoption initiatives. See Four Essentials for Digital Inclusion Efforts, Dr. Rhinesmith's introduction to his research.